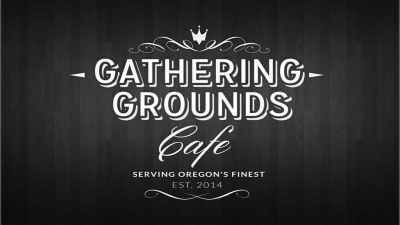 Today at GGC Coffee, we are continuing out brewing method comparison series. There are so many ways that these two styles are different. But there are surprising similarities as well. Let’s look at the bones of each structure, walk through a virtual brew using both methods and see how they measure up to each other. This lovely brewing method hit the coffee scene in the early 30’s during the big espresso boom in Europe. Like many entrepreneurs at the time, Luigi de Ponti drew up the initial design for this contraption in search of faster, stronger single serve coffee. After he drew up the blueprints, it was quickly put on the production line by Alfonso Bialetti. You may recognize this name because it is still thriving within the coffee business today. Originally fashioned in aluminum, this method has truly stood the test of time. 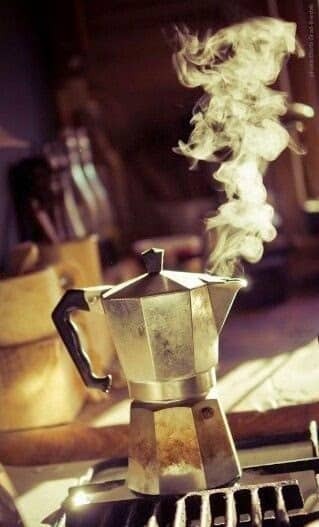 Coffee lore says that the moka pot was to be made in the likeness of clothing washing machines of that day and age. Luigi de Ponti is rumored to have sketched his first renditions of the stovetop espresso machine because he was inspired by the heat source that warmed up the sudds! Let’s do a little machine autopsy on the moka pot, as we mock-brew a cup of joe. The first step in the preparation of good coffee is simple as it is sometimes overlooked. I’d say old, bitter and rank. Needless to say, you can’t trust everything you hear. So when you take your pot apart to give the whole set-up a good scrub-a-dub-dub, you will see that it splits into 3 main parts. The bottom chamber is the water reservoir. Depending on the make and model of your machine, you may have a nifty “stop here” marker. But if you don’t, filling the receptacle just below the valve is the perfect measurement. Warning: be sure not to overfill this chamber. If you do, you can potentially burn yourself and will certainly have an incredible mess on your hands. As the water heats up to a boil, the pressure build up will cause the scalding hot water to spew from the sides of the machine. Moving on– once you’ve cleaned and filled the water reservoir with hot, filtered water, we can move on to the next piece: the portafilter. Although this bit is similar in shape to a portafilter you would dose to pull an espresso shot, you’ll notice some big differences right off the bat. The first is the extended pipe on the bottom of the basket. This is the piece that makes the magic happen. After you’ve thoroughly rid the portafilter of the remnants of the previous brew— all the sneaky little fines and the sticky oils that cling to the walls of the chamber, you can fill it with freshly ground coffee. It’s important to mind the water to coffee ratio here. There are a two ways to go about that. You can either choose to dose using the ol’ tablespoon method, which is quicker but not the most accurate. Or you can weigh your coffee grounds like a pro. You may have noticed that this is the typical dosage for an espresso shot. And though this method is sometimes called, “stove-top espresso” and it does have a, “portafilter.” These are just terms. The stove-top espresso moniker is quite ill-fitting. You will not get the right amount of pressure from a stove top which throws off the concentration. Less pressure means no crema, less concentrate–which means not true espresso. A more appropriate description of coffee brewed in a moka pot is “median between a strong drip and an espresso shot.” It just doesn’t roll off the tongue as well. Keep that in mind as you grind and dose. The level of grounds should not be espresso fine, (nor as coarse as a drip) and you should not pack the protafilter as tightly as you would for an espresso machine. Once you set the portafilter onto the water chamber, you come to a metal/mesh filter with a washer. Don’t neglect to wash these, they collect a build up of fines and oils because they protect the final product from being infiltrated by grounds. The icing on the cake is the top chamber which collects the coffee. Now that you have filled your newly clean and assembled moka pot, we’re ready to brew! Set it on top of the stove at medium heat. Pro tip: make sure you place the pot on outer portion of the stove top, keeping the handle as far away from heat as possible, but still allowing the entire bottom direct contact to the source. As the water comes to a boil, the pressure builds and pushes the liquid up through the shaft and into the portafilter. The water will collect flavor notes from the oils and acids while it pushes its way onward and upward through the openings at the top. When the pot starts to gurgle, it’s cuing you to take it off the burner and allow the rest of the brewing cycle to take it’s course. This process can be followed for any of the sizes available on the market. They typically come in the mini 1 cup, standard 3 cup, shareable 6 cup and the mega 12 cup. Most models in production nowadays are made in stainless steel. Though they are more expensive than the classic aluminum, stainless steel doesn’t warm due to extended exposure to acids and heat. But if you’re into the vintage look, they are still available, just harder to find. To read up on the difference in taste and health cautions between these two materials, click here. 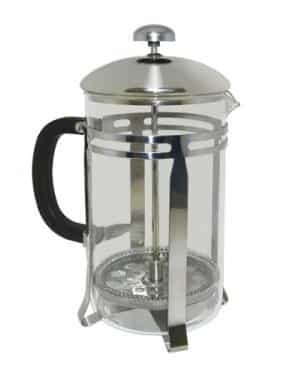 Check out our online shop to see our favorite moka pots. This method is a widely known house hold appliance. 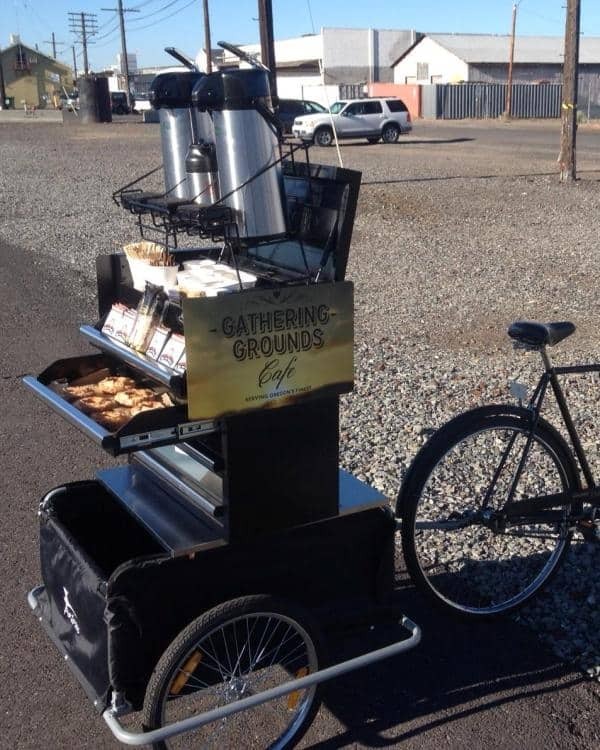 It is widely under estimated in coffee circles. A drip coffee is usually the cheapest thing on the menu– and is therefore not seen as specialty. But like every brewing method, it’s end product is only as good as the quality of beans. So boycotting the pre-ground coffee that is usually associated with this brewing style is the first step to making a great cup of coffee. Just like I stated in the previous section, keeping this rig clean is going to make a world of difference. I honestly can’t stress this enough, especially with electric drip machines. Washing the pot and the filter chamber is a good start. Just don’t leave the water reservoir out of your cleaning routine, or you’ll suffer the consequences. After about a month, there will be a scaly build up of minerals within that chamber. This accumulation is usually due to the water being unfiltered. But even with water ran through a Britta, or something like it, there will inevitably be white gunk on the inside of your machine. There are many ways to remedy that. Click here for some awesome descaler products that we recommend, or do it the old fashioned way and brew a concoction of 1 part white vinegar, 1 part water through the system. Regardless of which way you go about it, it’s a good rule of thumb to do a good clean about once a month. Now that you have a squeaky clean machine, the brewing process is pretty straight forward. 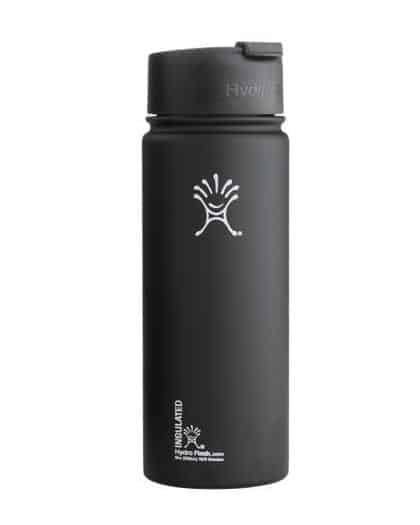 You pour filtered water into the top hatch. Then you measure out your ratio. The typical amount is 1.6-2g of grounds medium : 1 fl. oz of water. Pro tip: rinse the filter with warm filter water prior to filling it with grounds and placing it in the basket. This will wash that paper-y taste out, but will also pre-warm the filter holder, giving the beans a perfect platform to work with. Once the pre-moistened filter and dosed grounds are in the cradle you have two options. Option 1: bloom your grounds. I know this vocabulary is usually saved for pour overs like the Chemex, but the principal works the same way here. Pouring a small amount of water over beans in a circular motion, starting from the circumference, working your way into the center, allows the beans time to open up before the true brew begins. To find out how pour-overs and drip coffees are different, read our in-depth article here. Option 2: click the button and wait. 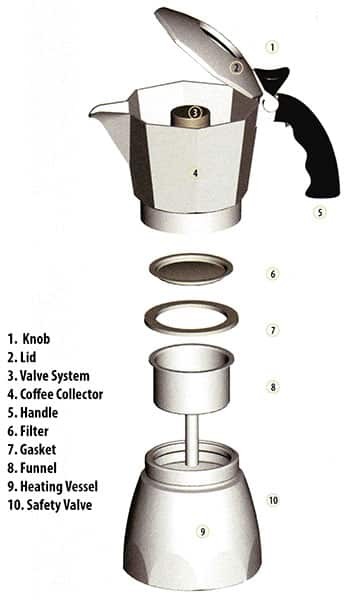 No matter which option you choose, it would seem as though this set up is much easier than the moka pot. Check out some of our favourite drip coffee machines in our online shop! BUT the internal structure is essentially the same. Just like the moka pot, you fill the water reservoir and apply heat. 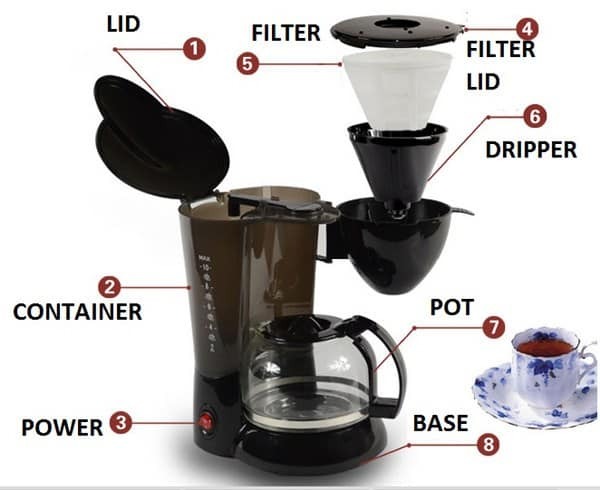 Unlike the moka pot, the warming system is built into the drip coffee machine’s body. As soon as you flip the switch, a teeny generator starts to boil the water. 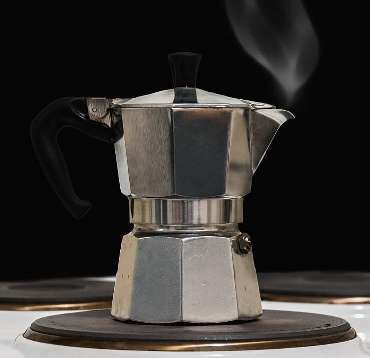 As it boils, the pressure moves the hot water up its tubing– just like the moka pot. The difference is in the delivery to the grounds. 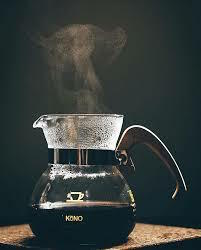 Moka pots depend on the water pressure to move the water through the grounds, whereas drip coffee pots use shower heads to spray the boiling water on top of the grounds and let gravity do the rest. And just like the moka pot, I recommend removing the pot from the heat. In this case, turn the little heating plate off. Even though this seems to be a nifty amenity, continued exposure to heat sets off chemical reactions that lead to that bitter diner taste that everyone hates. So, as we’ve found out, these two very different styles need the same things! Great beans ground correctly, filtered water, heat applied appropriately, and patience to tweak to your unique tastes. 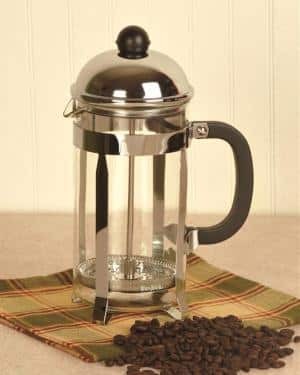 The 8 Best Electric Percolators for Coffee Lovers! Gaggia MDF VS Baratza Virtuoso: Which Grinder is Best?